The months spent planning and orchestrating a wedding is often a stressful time in many couples lives. There are a million details to figure out before the big day, and you’ll become inevitably stressed as you begin to realize just how much everything costs. You can get a personal loan from sites like Oink Money. But once the big day actually arrives, it’s often a whirlwind filled with dancing, speeches, and interacting with guests that leaves the bride and groom exhausted. Thankfully, at the end of the whole ordeal lies the honeymoon. That two-week long getaway on the beaches of Bali, where you and your new spouse can relax and truly enjoy your first few days as husband and wife together. Unfortunately, like everything else, the honeymoon is another hefty expense. 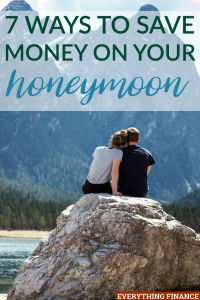 That being said, if you’re on a tight budget after paying for your wedding, here are seven ways to save on your honeymoon. One of the biggest costs to factor into your honeymoon budget is the airfare. Browse airline sites and price comparison sites to see all your cost options when it comes airline tickets. Often times, nonstops will cost more than flights that have a stop or two. And flights that go directly to your destination will likely cost less than ones that require you to purchase an additional ticket on their local airline to travel the final leg. Consider every flight possibility when deciding on your location. It’s an expense that can save you big. Every destination has their peak season of travel. Unfortunately, that infamous time of year that sees an invasion of tourists also sees inflated prices on all your vacation expenses. Do your research and try to plan your honeymoon on the low season instead. You’ll usually find great deals and bargains on everything from hotels, flights, transportation, and even food. Even better? You’ll avoid the massive crowds. When you think of your wedding registry, you probably think of kitchen knives, dishes, and other household goods to start your new life together. However, unless you’re getting married fairly young or are really aching for new home goods, you might find that you don’t need any of the items you’d normally find on a registry. If that’s the case, add your honeymoon to your registry. Set up a GoFundMe or go to honeyfund.com to have your friends and family contribute money to your vacation instead. You’ll be able to enjoy your relaxing getaway at little cost to you! It can be overwhelming when you’re planning a vacation. Like your wedding, there’s quite a few details to figure out and they all cost money. However, like most people, there are probably certain aspects of your trip that are more important to you than others. Maybe you’re dead set on staying at a 5-star hotel, or you’d love to try an array of high-end restaurants to enjoy the culture, or maybe you’d rather spend the majority of your budget on experiences and excursions. Whatever your passion, talk with your partner on the things you’d prefer to spend your money on. Then, opt for cheaper, on budget options on the rest of your vacation. That way you’ll get to thoroughly enjoy the things you’ll remember most. Instead of purchasing everything a la carte, consider going with a honeymoon package or all-inclusive resort for your vacation. You’ll find these packages at an array of beautiful destinations, and find your lodging, food, drink, and some excursions, all-included for one, set price. By going this route, you can pay all at once and truly relax on your honeymoon without having to worry about your budget or money again. That being said, carefully examine what is all included in said package. If you’ll end up paying for many of your added excursions as la carte items, it could end up costing more. So, make sure you’re really getting a good deal before booking anything. Location is a major aspect of cost, especially if you’re going out of the country. Some countries and cities just have a higher cost of living, and in others the exchange rate from the dollar is quite poor. Look into all of these factors as you’re deciding on a location. If you go someplace like Switzerland, where the cost of living is high and the exchange rate to the euro isn’t great, you’ll find yourself spending a lot more than you would have in Mexico or Jamaica. Moreover, as you begin to think about where you’d like to go, be sure to research holidays and festivals that take place in your destination of choice. Places tend to raise prices when a special even or holiday takes place, so be sure to plan your vacation around them. Hotels and resorts are probably the first things that come to mind when you think about where you’re going to stay. However, depending on the location and company, you sometimes find that your only options are the luxurious and expensive, or cheap and unappealing. If you’re on a budget, you might want to consider other options for your stay. Instead of going with a hotel, look into rental homes and condos, or go the Airbnb route. They’re usually less expensive than your hotel options. You’ll not only stay for cheaper, but you’ll also get to experience your destination like a true local. If you ask me, the honeymoon is the best part of the wedding. What could be more fun and exciting than traveling to some far-off paradise with the love of your life? That being said, you don’t want the cost of your vacation to cause you stress before you’ve even boarded the airplane. Try using some of these tips, so you can plan the perfect trip for both of you, and start your marriage off on-budget. Where are some places you’ve considered for your honeymoon? Have you looked for ways to save?